Last December, on a bitterly cold and snowy Saturday, thousands of people packed Canalside to welcome the new USS Little Rock into the Navy. Next month, near a naval base across the country, sailors and civilians will hold a wake for another ship with close ties to Buffalo. The USS Buffalo, a Los Angeles-class fast-attack submarine that launched in 1982, has concluded its service with the Navy. It’s a somber final act for a sub whose name provided a badly needed shot of hometown pride. The ship carried the Queen City’s name to the other side of the world, completing key missions from the Cold War to the War on Terror. “Buffalo, in its true spirit, went overboard at the launch and everything else,” said James F. Dentinger, the local developer whose late father, Fred, was a key link between naval officials and this area for many years. Workers now are carefully removing the Buffalo’s nuclear reactor and, following its decommissioning, will scrap the ship. But before that happens, a group of Western New Yorkers will join crew members past and present in July in Washington State to eulogize the USS Buffalo. 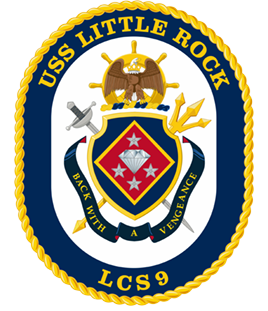 “It completes the circle in a very dignified way,” said Maurice L. “Moe” Naylon III, chairman of the local USS Little Rock Commissioning Committee. This submarine is the third U.S. ship named after Buffalo, according to Navy history. The first served as a patrol vessel and flotilla flagship during the War of 1812. The second served in the early 20th century and as a destroyer tender during World War I before its decommissioning in 1922. Jack Kemp, for many years as an influential Republican member of Congress from Hamburg, is credited with winning the Defense Department’s approval to name another ship after Buffalo. The keel for the 360-foot-long sub was laid in 1980 at the Newport News Shipbuilding Yard in Newport News, Va. Construction was finished two years later at a cost of an estimated $333 million, or more than $868 million today. Several thousand people traveled from this area to Newport News for the launch on May 8, 1982. Guests included then-Buffalo Mayor Jimmy Griffin and then-Erie County Executive Edward Rutkowski. Joanne Kemp, the congressman’s wife and ship’s sponsor, broke a bottle of champagne on the ship as it slipped into the water while their son, Jimmy, then 11 years old, stood on the sub’s sail, or tower. “There was no doubt that this was a really special day and a big deal,” said Jimmy Kemp, now president of the foundation named after his late father. For Rutkowski and the rest of the local delegation, naming the sub was a boost to a region reeling from a series of blows. The Courier-Express newspaper folded in 1982; Bethlehem Steel Corp. announced it would close its massive plant in Lackawanna; and the Bills that season started a run of six years without making the playoffs. The USS Buffalo, with the motto “Silent Thunder,” was commissioned on Nov. 5, 1983, at the height of “The Hunt for Red October” days of the Cold War. Los Angeles-class fast-attack subs like the Buffalo are prepared to wage war against other subs and surface ships, launch mines and gliders and conduct surveillance and reconnaissance, according to the Navy. “Attack submarines are very versatile,” said Mike Hewitt, a retired Navy captain and the Buffalo’s first commander. A part of the Pacific Fleet’s submarine force, the USS Buffalo was stationed at Pearl Harbor, Hawaii, and Guam. Buffalo embraced the sub. The original crew received “Talking Proud” bumper stickers. Bills- and other Buffalo-themed memorabilia filled the ship. “There was a Kittinger rocking chair that was given to each skipper for their house that still exists,” James Dentinger said. Unlike the Little Rock, a littoral combat ship that was commissioned next to its namesake ship at Canalside, the sub never came to Buffalo. Hewitt said that’s because prudence bars nuclear-powered vessels from the Great Lakes. But Hewitt and other USS Buffalo commanders made regular visits to the area. Hewitt most recently returned for the Little Rock’s commissioning and wore his old Navy uniform for the occasion. The USS Buffalo’s crew of about 150 sailors and officers went on their last mission in 2016 to participate in joint naval exercises with Indonesia and Singapore. 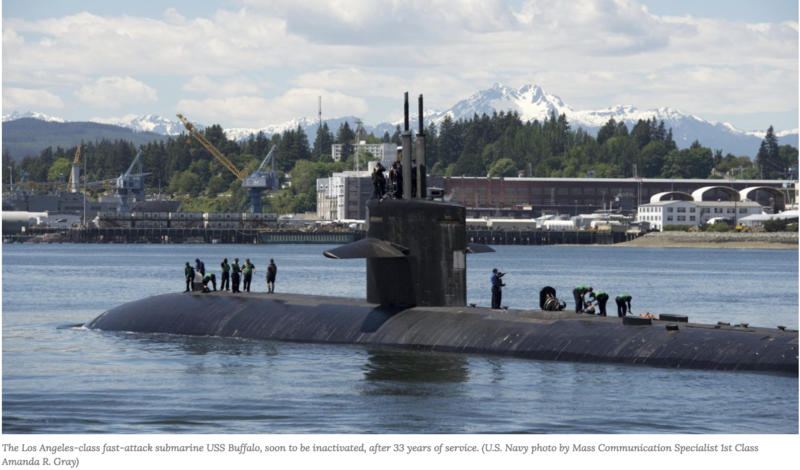 The sub returned to Pearl Harbor that December and, after more than 33 years in service, arrived at Naval Base Kitsap-Bremerton, in Bremerton, Wash., near Seattle, in May 2017. “Ships are designed for a certain lifetime,” Hewitt said, with 30 years considered typical for a nuclear-powered sub. Workers began inactivating the ship in April, said Lt. Commander Michael Smith, a public affairs officer for Submarine Group Nine. It’s an extensive process that begins with shutting down the sub’s nuclear reactor and includes the removal of fuels, gases and potentially hazardous materials along with anything that’s classified, Smith said. On July 16, the Navy will hold an inactivation ceremony, followed by a formal decommissioning at a later date. Because crews are working on the sub in an area where access is restricted, the ceremony will take place at the U.S. Naval Undersea Museum in nearby Keyport. A contingent of Buffalonians, and former crew members, expects to travel out for the occasion. Before that happens, some local officials want Buffalo to get a piece of the sub – ideally the sail – for the Buffalo & Erie County Naval and Military Park. Naylon, from the Little Rock committee, suggested replacing the sail from the USS Boston, which is on display at the park, and sending that off for display in Massachusetts. Smith said the Navy hasn’t received a formal request yet. With this USS Buffalo ending its service, advocates here want the Navy to name another ship after the City of Good Neighbors. That won’t be easy. Observers said if it’s going to happen now, the driving force likely would be Rep. Chris Collins, the Clarence Republican and close ally of President Trump, who recently sent a letter to the secretary of the Navy. “We respectfully request that you consider reviving the name USS Buffalo in recognition of those who bravely served and to honor our city’s proud heritage,” Collins wrote.